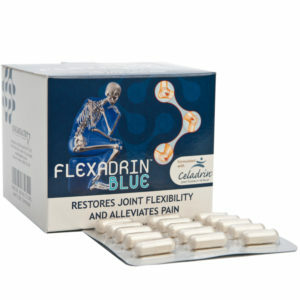 Flexadrin BLUE assists the body to restore joint flexibility and alleviate pain. Flexadrin BLUE™ is formulated with Celadrin® and the added benefits of Glucosamine. The dual action of Celadrin® and Glucosamine provides rapid joint cushioning, quickly alleviating inflammation, building cartilage and restoring the entire joint area. Flexadrin BLUE™ has a novel, all natural ingredient (Celadrin®) which has been medically shown to help the body reduce inflammation and pain. Flexadrin BLUE™ assists the body to enhance fluids that cushions your bones and joints to maintain flexibility and mobility so that you can move with ease and with less pain. CONTRA INDICATIONS AND WARNINGS: This product is not suitable for diabetics and people with seafood allergies. This product is not suitable for vegetarians.